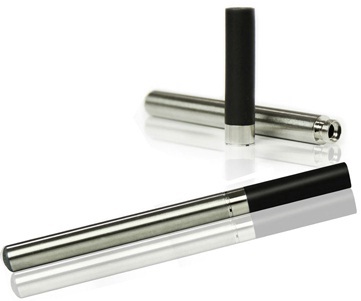 If you want an e-cig widely regarded as having better performance and providing a few more puffs per battery charge than the super-minis and are the most popular among forum members (with the possible exception of the new Fat Batts) – and you are comfortable with it being somewhat longer than an analog – consider one of Minis. The first two models discussed have unexposed wick atomizers; the atomizers for the last two are exposed. Batteries for most of the models were primarily automatic switch. However, during the past year, manual switch batteries have been introduced for the first three models presented here (most recently for the M401). They’ve only gained a firm foothold, however, with the 510 (it is now difficult to find an automatic 510 battery). The effectiveness and popularity of the manual 401 battery remains to be seen. The manual 901 (and the manual 801 to be discussed in our next installment) have had problems. Many dealers seem to be offering the manual 901 battery as a spare part, but not including it in the starting kit. The tried and true 118 mm DSE901 or the virtually identical RN4075 (but with a low-bridge atomizer) gets the job done, very well … and was the model recommended by Leaford for new vapers. It is an excellent choice if you would prefer an automatic switch battery – delivering power to the atomizer by sucking on the mouthpiece, rather than pressing a button. Most of the mods are designed to work with the 901/4075 atomizer (and with a couple others). Many different colors are available, (including pink at AquaVapor and VaporKings). Some of the inexpensive sources for the DSE901 are Good Prophets, LiteCigUSA, Rocky Mountain Vapor, Heaven Gifts, Domestic Vapor, Totally Wicked (“Mini”), MyVaporStore, VaporKings, and AquaVapor, the first three of which have free shipping. Vapor Kings’ and AquaVapor’s starter kits are the most expensive of this group, but include two atomizers. [NOTE: Actually, Good Prophets carries the “GP901,” about which all I know is this video review by kalojado.] 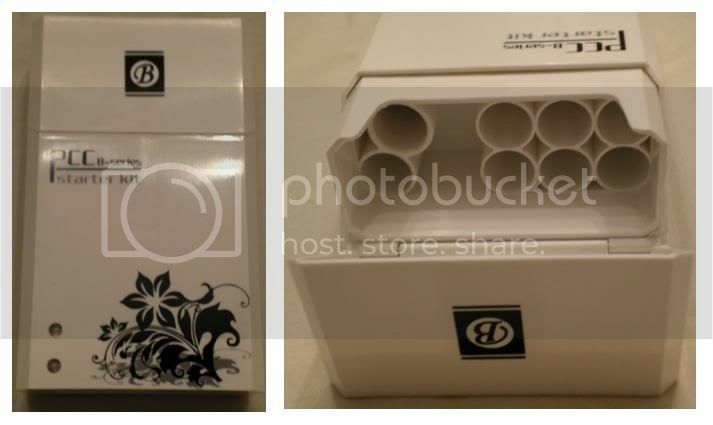 BestEcig’s BE901 is available from their own online store (China), as well as Indy Vapor Shop. The RN4075 also is tough to find; I’ve identified only myPVshop … and for atomizers and cartridges only: Heaven Gifts (China). For more information about the 901 and 4075, explore ECF’s DSE 901/b *Mini* and RN 4075 *Mini” model-specific sub-forums. The 112 mm Joye510 – aka Dura, Yeti, Titan, or simply 510 – has been the most popular model among forum members and received the 2009 Vapy Award* for Best Starter Kit. It scores well on all the evaluation factors (other than puffs per battery charge). The Joye 510 produces more vapor than any other electronic cigarette and is an ideal choice if you want full control of the vaping experience by pressing a button to engage its slender manual switch battery. * Modesty prevents me from commenting on why I am favorably disposed to the Vapy Awards. However, if you read Scottes’ post, you saw that he does not like the 510, although his wife does … and, recently, its supremacy is being challenged by the fat batts. The 510 atomizer also will work with most of the fat bats and mods … and remains king of the hill. Since the Joye 510 has been so successful, many other manufacturers have come up with their own versions. You read about two of them in the “Disposables” section of page 2. Sailebao’s DSE510, BestEcig’s BE510, and DeKang’s Boge 510 are others. Many vapers regard Joye as still the best. These days, most forum suppliers carry a 510 (not necessarily Joye). – Some of the U.S. suppliers with the least expensive Joye 510 starter kits are: Cignot, LiteCigUSA, Rocky Mountain Vapor, Domestic Vapor, NHaler, Liberty Flights US* [10% discount code: VGLF10], Ecigsupply, The House of Vapor, and Awesome Vapor. The 510 was one of the first e-cigs (following the blu and GreenCig) to have a PCC, which helps make up for a quickly tiring 180 mAh battery. Volcanoecigs’ more expensive MAGMA 510 kit comes with lots of prefilled cartridges (but only one atomizer) and a different style PCC, similar to (but larger than) the PCC for the Volcano super-mini. A longer 280 mAh Mega/XL battery (as well as Mega/XL atomizers and cartridges) are available for the 510, carried by Totally Wicked, Heaven Gifts, HealthCabin, and Janty. [NOTE: It is too long to fit in the PCC.] For most vapers, however, this mega battery has been supplanted by the much higher mAh fat batts. For more information about the 510, I refer you to The “Best” Electronic Cigarette here on VapingGuides … and to my three-part 510 Illustrated Guide in ECF’s NHaler supplier forum. Here are direct links to Parts 2 and 3 of that guide. [NOTE: Since that guide was commissioned by NHaler, it plugs and features that supplier’s products, but all comments about the 510 itself and how to use it are supplier-independent. Of course, as Vapy Award winning Best Overall Supplier, such touting is not entirely undeserved.] Read what the large 510 user community has to say about their e-cig in ECF’s Joye 510 model-specific sub-forum. The 108 mm M401, aka Pilot (found in ancient history texts), EVO, or Dragon is the “Mini” version (in this case meaning larger than) of the M402/403, i.e., all three have the same (exposed wick) atomizer; what differs is their battery size. It appeared, in black, at the bottom of the three-model comparison photos previously shown for those models. Here it is in silver. The M401 is available for $40 from LiteCigUSA, Domestic Vapor, Intellicig-USA (one-battery “EVO” kit), and Electronic-Cigz in Canada. 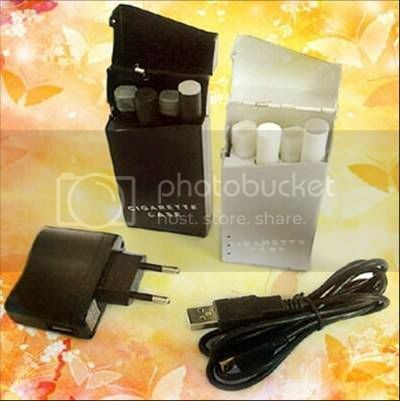 [Electronic-Cigz currently also offers a $29 no-box kit.] Like its smaller brothers, the M401 is fairly well regarded. 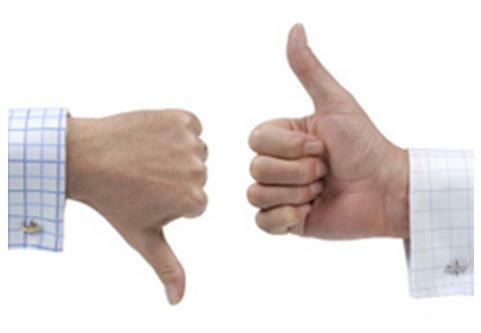 It is not as popular as the 510 and fewer and fewer suppliers are carrying it (but that doesn’t mean it’s not right for you, e.g., you might prefer its automatic switch battery and/or exposed wick atomizer). [NOTE: A manual battery version is now available.] If you are intrigued by the M401/2/3 series, consider getting the LiteCigUSA’s $50 M-4xx Ultimate Starter Kit (containing all three batteries) – change your e-cig size, depending on mood or circumstance. You can get the M401 in white, silver, or (as shown below) in black – with or without a nifty gold design (LiteCigUSA). A PCC ($23 from LiteCigUSA or $30 from Electronic-Cigz), similar in appearance and functionality to the M702 PCC, was introduced for the M401 in late 2009. It can charge one battery and carry four atomizers and/or cartridges, and another battery. 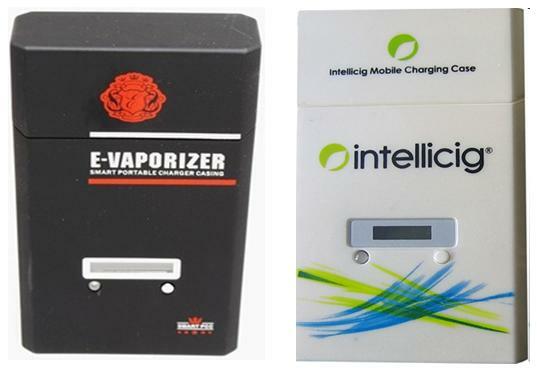 The “Intellicig Mobile Charging Case” on the right – with the same functionality but a more stylish appearance – sells for $40. 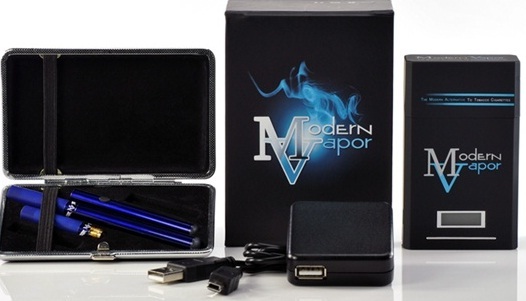 Modern Vapor’s Sidesho is a newer mini similar to (but not compatible with) the 401. It doesn’t have nearly as many users as the 401, but many of them like it. The $75 “Select” starter kit ($60 with their “20ECF” 20% discount code) comes with two batteries, two atomizers, four cartridges, and PCC (which, like the 401’s) charges one battery and can hold one additional battery, one atomizer, and four cartridges). There are many color choices: black, blue, pink, red, stainless, white, and white with stripes. Both auto and manual batteries are available. And notice that Sidesho carts are larger than M401. Read more about the Sidesho in ECF’s Modern Vapor supporting suppliers forum, including Bandit’s in-depth review and see cristania77’s first impressions. The RN4075 is tougher to find; I’ve identified only myPVshop … and for atomizers only: Puresmoker and Heaven Gifts (China).The RN4075 is tougher to find; I’ve identified only myPVshop … and for atomizers only: Puresmoker and Heaven Gifts (China).